Dementia is a progressive syndrome, meaning that it worsens over time. Identifying early symptoms is key to treating and managing dementia over the long-term. Dementia is a syndrome (note: not a disease) that encompasses a group of symptoms that affect memory, reasoning, mood, and other cognitive tasks. 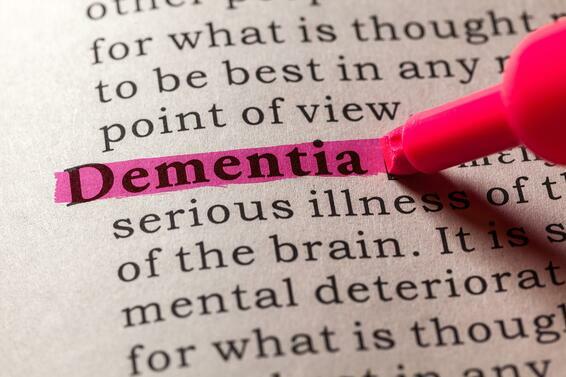 In other words, dementia is not a disease but rather an umbrella syndrome defined by many symptoms related to memory loss, decreased communication skills, inability to perform everyday tasks, and other related issues. More on these symptoms, below. Alzheimer’s disease is the most common type of dementia. Whereas dementia is a syndrome (a group of symptoms), Alzheimer’s is a disease, caused by disrupted communication between neurons in the brain, which ultimately leads to loss of function and brain cell death. The symptoms related to this progressive loss of function fall under the same umbrella as the group of symptoms that define dementia – meaning that Alzheimer’s disease is one type of dementia. While Alzheimer’s accounts for 50-70% of all dementia cases, the syndrome may also be caused by stroke, vascular disease, depression, infections, and chronic drug use, among others. As dementia progresses, it affects a person’s ability to function and live independently. As such, dementia is a common cause of disability in elder adults: over time, as the syndrome worsens, dementia sufferers may lose their ability to feed themselves, shower, and perform other daily tasks. It can even affect personality, as well as the ability to communicate and reason. Dementia is a leading cause of emotional and financial strain on caregivers and the families of aging adults. Dementia often begins with mild symptoms, many of which can be confused with other issues and general aging. Dementia diagnosis is based on the identification of at least two impaired mental functions. While early signs of dementia often go unrecognized, one of the most obvious and earliest symptoms is memory loss. Short-term memory problems can be subtle – often, you could brush off these subtle symptoms as absent-mindedness or forgetfulness – and they often relate to simple issues, like forgetting where they left something, remembering what they had for breakfast, or forgetting why they’ve entered a room. Due to memory loss, you may also recognize symptoms of repetition: repeating daily tasks (ex. shaving twice in one day), repeating questions, obsessive collection of items, and more. This symptom is sneaky: You think it would be easy to recognize, but often, it masquerades as cautiousness. For example, as a loved one ages, they might become more careful about locking their doors at night. Normal safety precaution, or a sign of paranoia? Dementia-based paranoia and suspiciousness begin with delusions – essentially, something they believe to be true but that is false. (Examples: Thieves are in the neighborhood. Neighbors are peeping in their windows.) These delusions, which notably do not always manifest as full-on hallucinations, breed paranoia and suspicion. Take note of these behaviors. If, upon questioning, they appear to be rooted in delusion, your loved one may be showing early signs of dementia. Dementia affects judgement, which in turn can have an effect on personality and mood. Depression, anxiety, and apathy (listlessness, lack of care) are common warning signs of dementia. Extreme and sudden emotion, including agitation, aggression or anger, may also occur. Inappropriate behavior may also manifest. Collectively, such changes represent the psychological symptoms of dementia. Memory loss walks hand-in-hand with a loss of words. If your loved one is struggling to find words to communicate, has difficulty explaining something, or cannot express themselves easily and clearly, this may be an early symptom of dementia. Along the same lines, dementia can cause confusion in everyday situations. What younger people refer to as a “slip of the mind” – aka, a temporary mental lapse – dementia sufferers experience regularly: they may fail to recognize faces, remember appointments, follow directions, find the right words (see above), locate an item, or any number of other small details that lead to temporary confusion. Confusion may also manifest as a temporary misperception of time and place, such as mistaking a grandson for his father at a younger age. In the early stages of dementia, a simple reminder will often prompt someone to “snap out” of their confusion. A classic early sign of dementia is an inability to follow conversation or a storyline, be it in real life or on TV/in a movie. This is often due to temporarily forgetting the meaning of a word. Dementia can cause fear of the unknown, making sufferers resistant to any type of change in their routine or daily life. They may become homebodies and refuse new experiences. Due to various causes (temporary forgetfulness, confusion, inability to complete basic tasks), you may notice changes to a loved one’s personal care routine: daily grooming, bathing, styling, and other previously-everyday tasks. The ability to plan and execute other ordinary tasks, such as balancing a checkbook, writing a letter, or following a recipe to prepare a meal may appear even earlier. There are a number of other potential signs of dementia, as well, some of which may be surprising, such as an inability to detect lies, sarcasm, or insincere speech, and major shifts to the sense of taste, often resulting in sudden new cravings – perhaps a loved one suddenly has an interest in consuming lots of sweets, whereas they previously avoided such foods. A slowdown in walking speed is also common; if you notice that it’s taking a loved one much longer to navigate from the kitchen to the living room, it could be a sign of something more than the typical aging process. In some cases, people suffering from dementia may even engage in criminal activities, such as trespassing or stealing. This sign is most commonly associated with a specific type of dementia known as frontotemporal dementia (FTD), which impacts the frontal lobes of the brain associated with executive functioning and reasoning. Dementia is progressive. This means that symptoms begin mildly, and then gradually get worse. If your loved one is exhibiting any of the early signs and symptoms of dementia, don’t ignore them. Get ahead of the syndrome with early intervention from a medical professional. In some cases, dementia symptoms are caused by an underlying problem and may be reversed. In other cases, dementia is irreversible. However, early diagnosis is important. You can put plans in place while your loved one is still in control of his or her faculties. You can discuss treatment and/or management. And, you can plan for the future. When it comes to dementia, ignorance is not bliss. We encourage you to see a doctor, as soon as you recognize any of the above symptoms in yourself or a loved one.